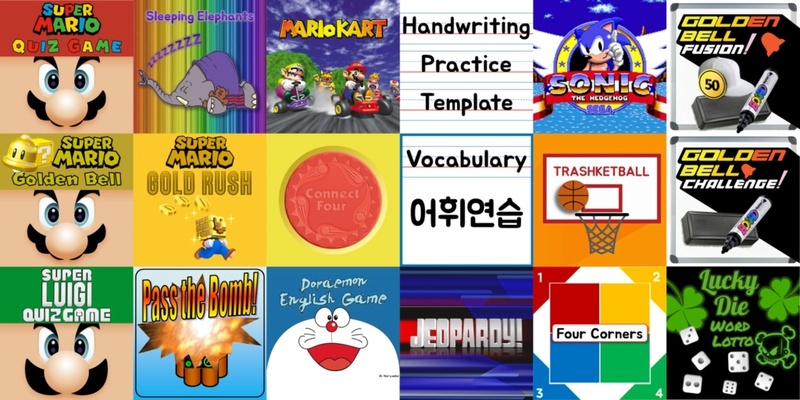 This is a collection of all the games I made in the six years I spent teaching in Korea. I recently revisited them to add some extra features and address some issues I learned to fix while I studied for PPT MOS Certification. My main goal was to make everything easier to use and share. Open the catalog to view the details of each game. I have included all these files into a single “archive” so that you won’t need to download each file individually. Over the next few weeks I will be uploading videos describing how to use each game on my Facebook page. I'll also be making tutorial videos about some of the techniques I used when making these games soon. I'm sorry not to include any images of the games in the post, but going through each of them to get pictures would have taken a really long time. Check the Slide Notes and Slide Master Archive Catalog for the compatibility of each game. Look below the picture for each individual game or download the entire Slide Master Archive. Golden Bell Challenge! and Golden Bell Fusion! Thank you so much for posting these powelldr. It will take a while to look through them all, but it looks like you have developed some awesome non-VBA techniques that I can't wait to explore further and look forward especially to any tutorials that you might be able to provide. Even if it takes me a month I have to have a go at each game in turn! Welcome to PowerPoint Creative, powelldr! Glad to see you made it over here ok from waygook! Thanks for sharing your great selection of games, and hope to see you around with more games in the future!